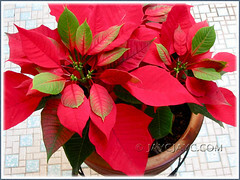 The ever-popular flowering plant for the holiday season of Christmas worldwide! 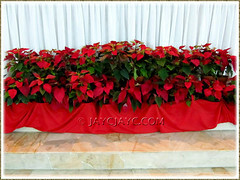 About 30-40 potted plants of the vibrant red Christmas-flowering Poinsettia were being used to decorate the base of our Church’s altar and rostrum for this Christmas season. How lovely! When grouped together, they appear so cheerful and irresistably beautiful, blending explicitly with the Christmas decor or colour theme of red and green chosen this year! Seeing them brought back loving memories of its outstanding presence in our tropical garden years ago. Just one potted plant of the typical Euphorbia pulcherrima was enough to illuminate our whole courtyard with its brightly red-coloured bracts (modified leaves) that stood distinctly amongst the greens therein. We got to enjoy this beauty for quite a while, from September 2006 till mid 2007. Not so pretty though as it aged, became spindly, leggy and produced much more green leaves than the vibrant red ones. Whatever, we threw in the towel when it became heavily infested with mealy bugs! Since then, we’ve managed to resist the urge to get one for Christmas. My beloved will always remind me of the mealybugs whenever I’m tempted to buy one! Humph! Garden nurseries, supermarkets and florists are doing a roaring trade selling these poinsettias during the holiday season. They’re rather inexpensive actually. Locally, each small pot costs between RM9 to RM12, but one can get it for almost half the price during off-season. Somehow, they remind me of the Mussaendas. You may want to consider the Mussaenda erythrophylla (Red Mussaenda), another lovely shrub with brilliant red bracts for Christmas if you want an alternative! Etymology: The species name, pulcherrima, meaning ‘very beautiful’ was assigned by Wilenow, the German botanist. Poinsettia is named after Joel Roberts Poinsett, the first US Ambassador to Mexico, who introduced the plants to the United States in 1828. Origin: Native to the tropical regions of Mexico and Central America, but widely cultivated. Features:Euphorbia pulcherrima is a species of the genus Euphorbia and has over a hundred varieties. An evergreen or semi-deciduous perennial (depending on the region’s climate) shrub that can reach 3 meter high or more in its natural habitat or when ground grown. It has multiple and erect stems that are smooth and green, and covered with dark green leaves that are large and oval-shaped with pointed tips. Some leaves may have a couple of irregular notches on the sides too. Its great attraction are the whorls of brilliant and colourful bracts or modified leaves that are held above the dark green foliage which are mistaken as flower clusters by most people. The typical species plant usually have about 8-10 vibrant red bracts, measuring 10-18 cm in length and differing from the commercially cultivated varieties that have more numerous and larger bracts. 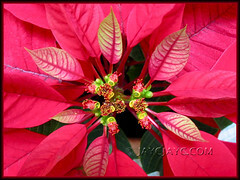 The actual Poinsettia flowers are the small golden cups, known as cyathia, appearing at the top and center of the colourful and showy bracts. 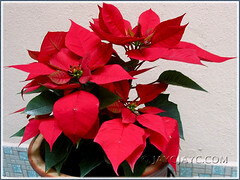 The holiday poinsettias that we usually purchase for Christmas are much more compact and dwarfish, presenting a miniature version of the large native Poinsettia bush. They’re best grown indoors as potted plants. Besides the traditional red, you can now find numerous cultivars with beautiful coloured bracts, ranging from pink to coral, white to yellow and even variegated ones. Poinsettias are relatively long-lasting plants, chiefly grown for their colourful and stunning bracts, and popularly sought as decorative holiday plants during the Christmas season. With proper care, the showy bracts can last for several months and the plant can continue its growth for several years. 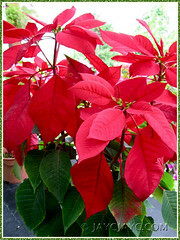 Culture (Care): Euphorbia pulcherrima or popularly known as Poinsettia is quite easy-growing and needs minimum care. Light: Bright light or filtered sunlight but never under direct sun. Ideally, it requires daytime temperatures of 60-70°F and night-time temps around 55-60°F. Protect from hot or cold drafts. Drafts, low temperatures and overwatering may cause the leaves to curl, wilt, turn yellow and drop. Moisture: Average water requirement. Soil to be kept uniformly moist but allow the soil surface to dry out between waterings. It needs high humidity. To maintain humidity, mist often or stand potted plant on a tray of pebbles filled with water to just below its base, if necessary. Never allow the pot to sit in water as plant may suffer from permanent root-rot damage. Keep plant dryer when dormant. Soil: Any enriched and well-drained soil. 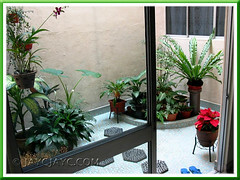 Others: Feed once monthly with a water soluble houseplant fertilizer during active growth and cease when it is in bloom. Prune regularly (in spring to early summer) to maintain desired shrub-size, encourage branching and increase flowering. To encourage flowering and colourful bracts, Poinsettias need 8 weeks of shorter daylight hours (6-8 hours) and longer night hours of complete darkness (14 hours) – read more on how-to get your poinsettia to rebloom the following Christmas. Mealybugs can be a problem, especially on the underside of leaves. Be vigilant and treat it early. Be aware that Poinsettia is not poisonous but like many plants in the Euphorbiaceae family, is known to ooze a milky sap that may cause skin irritation and an upset stomach if consumed in large enough quantities. Wear gloves when handling or pruning the plant if you’re prone to skin rashes. For sub-tropical and temperate zones: Hardiness: USDA Zone 9-11. 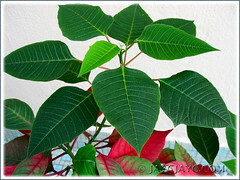 Poinsettias are frost-sensitive and any exposure to frost will usually kill back a poinsettia plant. It dislike hot and cold drafts. Protect from frost by growing as a container plant indoors or in a greenhouse. Propagation: Use healthy tip cuttings about 8-10 cm long from new shoots. Snip off just below a leaf joint and remove the basal leaves. Then, push it about 2.5 cm deep into the moistened potting medium and firm the soil gently around the stem. Locate the pot in a warm and bright place, away from the direct sun. When new shoots appear, pinch out the growing tips to encourage bushiness. Usage: Poinsettias make excellent decorative houseplants or indoor potted accents for interiorscape settings in homes, offices or shopping malls, especially during the Christmas season. Outdoors, in frost-free regions, plant it as an accent or single specimen to add colour, beauty and interest to your yard/garden or as a container plant under covered porch or decks. Ideal too in mixed shrub groupings and hedges. 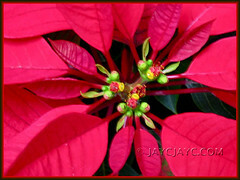 Poinsettias are lovely and auspicious for the Lunar New Year too. Wishing you and John and family Happy New Year 2011! Oh I see….so just buy 1 to enjoy for 2 festive seasons back to back, huh! Thanks, A. Belle….a blessed and fulfilling 2011 to you and family too! Have you heard of the Euphorbia “Fireball”, a big curly red head of flowers? Never heard of this plant, Annette! Google searched for an image to admire but unsuccessful?